No longer joined at the corporate hip, the auctioneer and its long-time payments partner face off to see which is the better stock to add to your portfolio right now. Can the one-time eBay subsidiary outperform its former parent company? Credit: eBay and PayPal. It used to be that, when you owned shares of eBay (NASDAQ:EBAY), you also owned a piece of PayPal Holdings (NASDAQ:PYPL). That all changed in July of last year when the one-time payments subsidiary spun out on its own. What if you don't want to own both stocks? Which should you choose? Answering that question requires a closer look at the management, financial condition, and valuation of each business. Shall we dig in? Management commitment and quality. Generally, seeing insiders own more than 5% of the shares outstanding is excellent. Here, it just means that eBay founder Pierre Omidyar has kept meaningful positions in both eBay and PayPal stock. Of the two CEOs, Dan Schulman has been at the helm about nine months longer. Calling this anything other than a draw seems unfair. Financial condition. 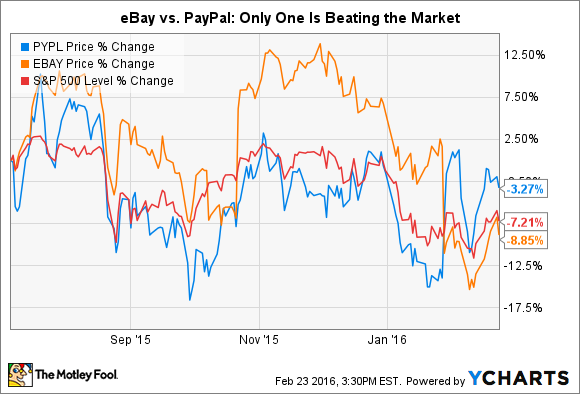 Both eBay and PayPal look strong on the merits. The difference, as the table shows, is that eBay has a lot more debt. Bountiful cash flow helps the auctioneer keep a lid on its obligations and their impact -- a good thing. But that's also not much of a selling point when compared with PayPal's debt-free balance sheet. CEO Schulman can fund more risks with fewer consequences as a result. Valuation. In many ways, eBay is a relic of a bygone era. Analysts polled by say the one-time dot-com superstar is on track to grow earnings by just 5.88% annually during the next three-to-five years. PayPal, a huge player in the emerging mobile payments market, is growing 2.8 times faster, yet trading for just 2.4 times eBay's price-to-earnings multiple. The delta -- 2.4 times earnings for 2.8 times as much growth -- tells me that investors aren't yet giving PayPal the premium it deserves. By the numbers, PayPal is not only a faster grower, but is also better protected, thanks to a clean balance sheet and similarly generous cash flows from operations. Factor in stock momentum and a global movement to enable secure electronic payments anytime, anywhere, and it seems to me that PayPal is the better buy at current levels.